New Year is coming soon. Japan is getting busy to get ready for the new year. We would like our guests to experience Japanese new year and we serve a special new year's breakfast called osechi-ryori on January 1st. Japanese people eat osechi-ryori in the morning on new year. This is our tradition. On January 2nd, Japanese people practice chirography. 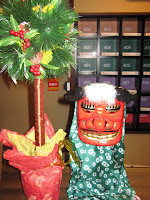 This is one of the New Year's Japanese Costumes called Kakizome. 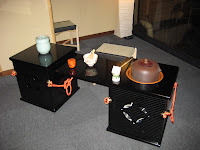 The calligrapher is going to come our ryokan and perform chirography. You can also try to practice chirography! Next year, we are planning to hold kakizome on 3rd. 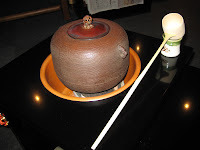 We are going to have Tea Ceremony next year as usual. We are planning to do it every Saturday in February from 14th. *Please note that it might be changed. I guess many people have already decorated their houses for christmas. Japan is not a Catholic country, so we don't really adore christmas and have a routine on christmas day. 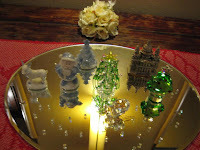 We don't have a custom like spending christmas time with family nor don't get together with relatives. 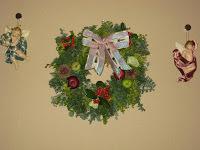 What we do on christmas is having a party with friends or going for dinner with girlfriend or boyfriend. 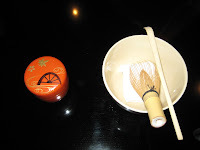 We NISHIYAMA RYOKAN also decorated our ryokan a little bit. 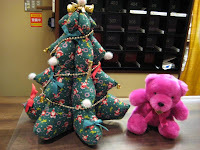 A hand made small christmas tree and a little bear welcome you at the reception! I can't believe this year is about to finish. How fast time passes. Christmas is just around the corner and autumn is almost over. 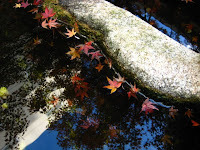 NISHIYAMA RYOKAN has a beautiful garden and you can see different faces depending on the season. 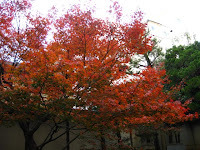 Now, all leaves are changing their colors. Look at these beautiful floating leaves! 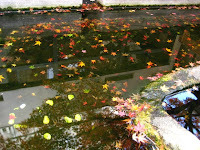 When you come to NISHIYAMA RYOKAN, please enjoy diffrent scene in each season. Bento is packed lunch in Japanese. Japanese take bento to school, work and picnic for our lunch. Although bento is readily available in many places throughout Japan, including convenience stores, bento shops, train stations, and department stores but it is also common mother make bento at home for their kids or husband evey morning. My mother could not make bento like this cute but if I take this to school I could not eat it because this is very cute !! I dont wanna destroy it. when I was in Australia my Australian mother make sandwich for me for my lunch. I heard Indian take curry for their lunch I am not sure this is ture or not. It is interesting to know what people eating for lunch. when you come to japan you can buy Bento and enjoy japanese Lunch .